I’m a confirmed night owl, as anybody who knows me well can attest to—and apparently I’m one by nature, since my mom tells me I used to drive her crazy by lying awake in my crib all night. However, I suspect I’m also a night owl by choice. I love late night dining and those great extended conversations you get into at after-hours spots, the opportunities for people watching that only happen after about 10 p.m., basically the whole experience. When I was a little kid, my parents took me to a famous Polynesian-themed restaurant called Trader Vic’s while we were on vacation. It was a hot spot at the time, and I was immediately dazzled by the restaurant’s glamorous, exotic ambiance, not to mention those fancy drinks with fruit garnishes and pink umbrellas. I’ve harbored nostalgic feelings for tropical restaurants and bars ever since, so it’s no surprise that I fell in love with 4 Kahunas as soon as I walked through the door. This cozy island retreat initially lures you in with low-lit colors, dreamy surf music and tons of delightfully kitschy tiki décor, and then hooks you with a menu packed with enormous, delicious cocktails, all with poetic names like Blackbeard’s Ghost and Three Hour Tour. Come when you can spend some time. If you haven’t yet been to Texas Live!, the first thing you need to know is that it’s actually a collection of venues, such as Guy Fieri’s Taco Joint, Pudge’s Pizza, Miller Tavern, PBR Texas (a cowboy/cowgirl bar where you can ride a mechanical bull), and Sports & Social Arlington (a games-drinks-bar food destination). And that’s just a partial list! 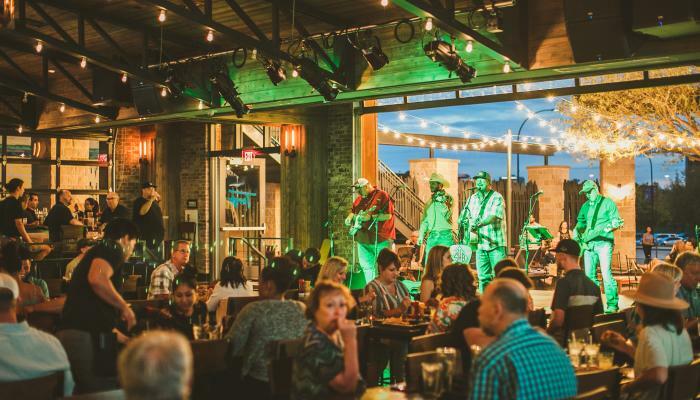 The second thing you need to know is that there’s always something going on at Texas Live! late night, but especially if you’re looking to catch some action post-Rangers, post-Cowboys or post-concert. Check out the Texas Live event calendar to learn more. In addition to late night hours, there are four reasons I love Hooligan’s Pub: One: Hooligan’s has a “Cheers” kind of vibe mixed with a college-bar-in-another-town atmosphere I really like. Two: it has a digital jukebox that has taken a lot of my money (and will no doubt take more in the future). Three: You can sit outside when the weather is nice. And four: You can order food deliveries from the neighboring J. Gilligan’s (another great late night spot), which in my case means ordering Irish Nachos—of course! I like late night spots where you can just hang and talk and listen to music, but I also like places where you can actually do stuff, which is one reason why I was excited when Free Play Arlington opened up for business. This super-fun retro arcade room caters primarily to grown-ups after the sun goes down—no kids are allowed after 9 p.m., and they offer an adult-friendly menu of sophisticated bar food you can use to fuel a few extra sessions of Donkey Kong or Frogger. Are you a night owl with a sense of humor? Improv Comedy regularly offers shows after 9 p.m., which makes it a good choice for evenings when you want a later start or you want to work in something else first. Plus, there are two additional late night spots near the club you can hit up for drinks, bites, and games: Bar Louie, which is open until 2 a.m., and Dave & Buster’s, which is open until midnight or 1 a.m., depending on the day of the week.